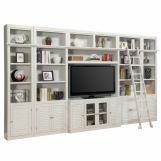 Add functional storage space to your family room, library or home office with the transitional style of the Boca Modular Office Suite Collection. 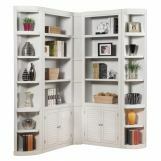 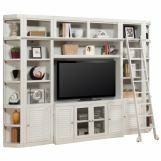 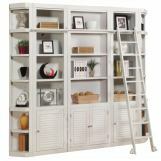 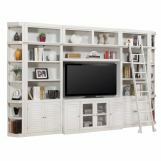 Gorgeous to behold, the collection is constructed from poplar solids and birch veneers with a quaint Cottage White painted finish and louvered accents. 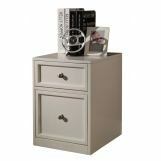 Cabinets lock together with connector bolts for durable support, while the inside and outside corner units contribute to a seamless, tailored look. 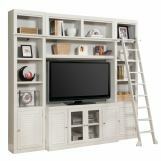 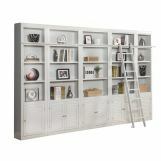 Abundant shelving, drawers and cabinets offer a full range of storage possibilities. 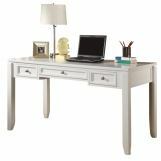 Additional features of the Boca Collection include an optional bookcase ladder, four-door TV console, various sizes of writing desks and a rolling file drawer.